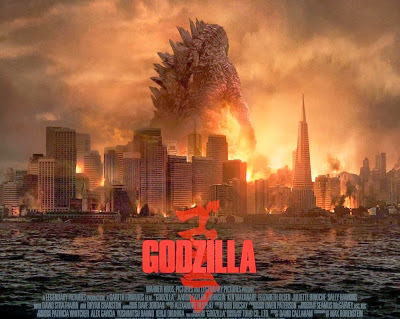 Godzilla (2014) – Review – Screenkicker! 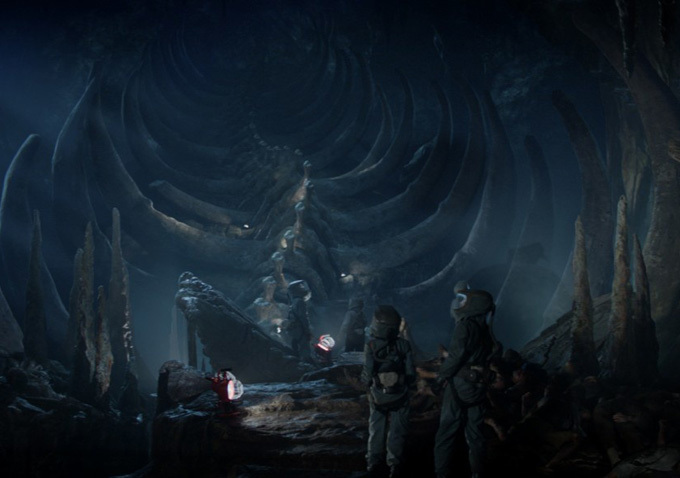 If Monsters proved that Gareth Edwards can produce a great movie on a shoestring budget then Godzilla shows that if you give a director too much money he’ll feel the need to spend ALL of it. Meaning Godzilla is almost great apart from the long grind you have to go through to get to the good stuff. A bit like a first date but with a hideous monster. So exactly like a first date then. The convoluted story sees Bryan Cranston shouting incessantly about a vague threat to the world. He blames this for his wife’s death and devotes his life to finding out what’s going on. His grown up son get’s roped into it and we spend the next hour with Cranston shouting some more until we discover that monsters did it all. Yep, all of that theorizing, crying, father son bonding, all to reach the conclusion that your wife got smushed by an enormous prehistoric beast. Bear in mind that Godzilla hasn’t made an appearance yet and it’s his movie. There’s more talking among the army and then the big guy shows up. And he’s beautiful. This Godzilla is both a modern update and a faithful version of the original Japanese King of the Monsters. This isn’t that awful 1998 monstrocity that hit our screens previously. This Godzilla looks like a 21st century version of the man in the giant rubber suit from such classics as Mothra vs Godzilla and Godzilla vs King Ghidorah. He’s the best thing in the film. Gareth Edwards does an amazing job of shooting the action that takes place sporadically throughout the movie. The set pieces are exciting to watch, from Godzilla daintly smashing his way through the Golden Gate Bridge, to the battle to transport a train full of missiles across the country, and finally to the massive smackdown at the end. A lot of scenes are also incredibly beautiful, the red flares slowly falling to reveal the title character, the pure adrenalin rush of the HALO jump, the planes falling out of the sky after an EMP attack. Edwards has a good eye for finding beauty in the strangest of places, something he demonstrated well with his first film Monsters. Then we have the cast. 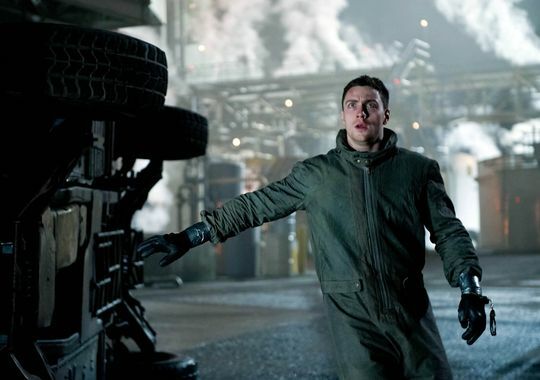 Aaron Taylor-Johnson is extremely likable as the main human hero Ford Brody, Screenkicker favourite Elizabeth Olsen is wasted as his worried wife, Ken Watanabe stares into the distance with a look of terror, and did I mention Bryan Cranston shouts a lot? 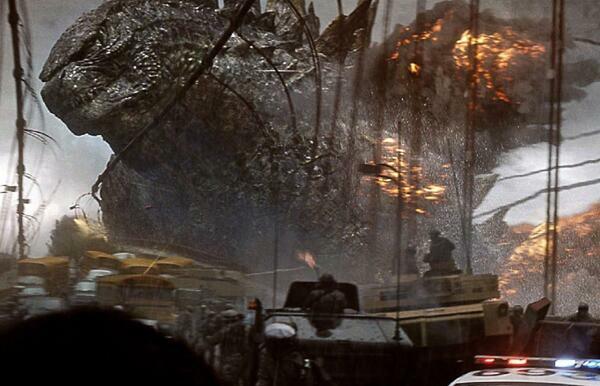 However it’s Godzilla everyone came to see and he outclasses all of the other actors by the end. Climaxing with a huge showdown in San Francisco, Edwards pulls out all the stops to give the audience what they want – carnage. My only problem here is that San Fran isn’t a very exciting city to see being destroyed. Apart from the Golden Gate there aren’t many recognizable landmarks. Godzilla doesn’t even try to use a couple of trams as roller skates (I should write movies). Compared to the epic Hong-Kong battle in Pacific Rim, this fight looks a tad dull. I would have liked big G to cause destruction in Tokyo for old times sake but it looks like the producers wanted to appeal to an American audience. What are we left with? Godzilla is an incredibly dull film for the first hour or so. The plot is needlessly complicated when it should be a simple battle of the monsters. Most of the excellent cast get nothing to do except explain the story, while most of the characters appear to be idiots – how do you lose track of a 30 foot high monster so easily, it’s not the Predator. But once you get over the initial grinding boredom, it all comes alive, stuff happens, and you begin to realise what you love about the film – you love Godzilla. Try not to fall asleep before the good half kicks off (I’m looking at you SP!). Sounds like this might plod along a bit in places but I’m still keen to see it. I’m happy to watch Cranston shouting incessantly for an hour before the action starts. BTW am I right in saying ATJ and Liz Olsen play a couple in this? Weird since they are set to play siblings in Avengers 2. You guys are both irish – I’m shocked that siblings being a couple isn’t something you’re very familiar with. Hence your deformed colon – whistle me dixie you guys are likely brothers. I want to see this. Will you go again? I’m the opposite dude! 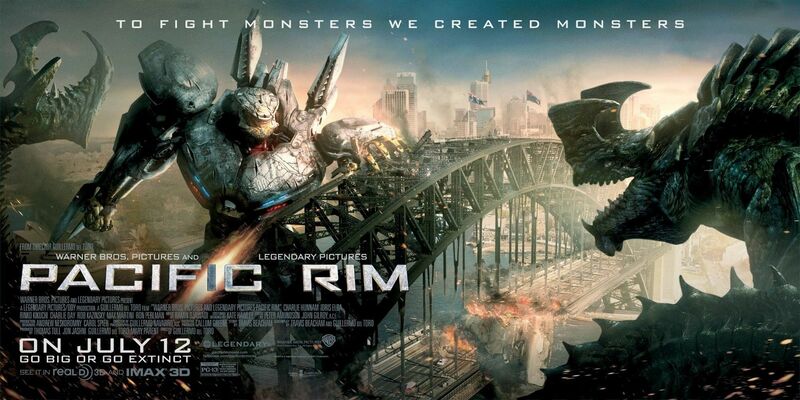 I liked it better than Pacific Rim and thought less monster was a good move. Edwards went the old school monster route and I thought it was a great move! Loved it! I thought the opening scene were great and never got bored. Although I can totally see why that can be said! Cranston entertained me! A lot of fun. Even if the build-up to Godzilla himself was a bit long-winded, it still worked for me because I was always interested. Good review. Good stuff Mikey, might want to get that colon checked again. The plodding along for me didnt achieve what it needed to. Plodding for character building is ok when it works. Never worked here in that I didnt care about the family at all. More monsters, more time with monsters and bring in Gamera! Yeah, there was too much focus on the build up to the MUTOs. Then there was a long build up to Godzilla. Just too much filler for me. Gamera would have those assholes for breakfast! I found Cranston a bit over the top. It was as if he thought he was in a different film. He needed to relax a bit! Huh well, we’ll see! I’ve just read a glowing review and now your lukewarm review back-to-back, so I’m not sure what to think. I haven’t seen Pacific Rim so I can’t use that as a frame of reference, either. Ha, love the Italian football comparison Mikey! Great review, looking forward to seeing this myself. HaHa! I love how you compared the movie to an Italian football match Mikey! I hate football, but I can well imagine…I’m still laughing! Awww thanks for the kind words Sherri! I think you and your daughter will really enjoy it, I was probably expecting too much and was in a bad mood! Glad you liked Lego movie! Yep I agree Mikey, took waaaay too long to get to the monster. I mean heck, if I want all that drama, I’d see something else. I don’t know why they took this story so seriously, it should’ve been more fun and camp I think. The SFX is great but overall it wasn’t as enjoyable as I had hoped. There was too much drama for me! It felt like watching a Ken Loach film! I’d definitely love to watch the second half again though. I liked it more than you did, but good review. The first Godzilla film took a while to get to the monster. I was okay with that though because I liked the story here and once Big G rolled in it was worth the weight. I expect when he likely battles Mothra in the sequel we’ll see more monster fighting that time around. Nice review. I assume. Lol. Okay – skimmed it as I hope to watch this soon. Sounds a little disappointing, though? Exactly like a first date? What the hell kind of women have you been dating man? And ‘Zilla on skates would be off the hook! Haha the memories are too painful! Sounds like a horrible date! You have to make a lot of interesting and impressive conversation before anything good happens. It’s a shame because like you said the director is capable and it probably had a lot of potential. I liked this very much, and it is the best blockbuster out right now imo (The Winter Solder came out before summer season lol). I was fine with the build to the big guy because even when he was not present, his presence was always felt. Solid review though. I didn’t mind Godzilla showing up late to his own party, but not when the on screen characters were all so terribly dull. Great review. And just as a side note: hey, I’d watch an entire movie based on Godzilla wearing trams as roller skates, ha! Haha thanks Jade, maybe he’ll rollerblade in the sequel! After this and X-Men i think you might be the female version of me!